Why do you buy local products? There are a lot of great reasons for buying locally, ranging from community support to global responsibility. Our world has expanded to an on-demand, instant gratification land of experiences. Every decision made is made with the inclination toward making "me" feel better. 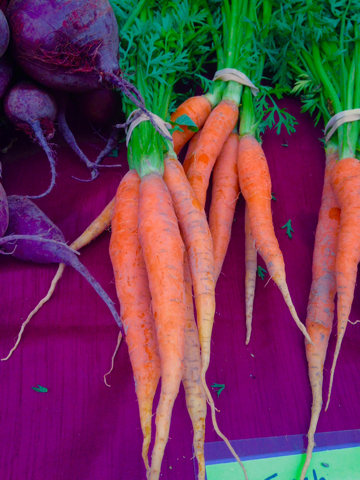 Buying local has evolved from what makes "me" happy to making the world better. A noble change in attitude to be sure, but I still feel we miss the point. If we take all the grand, world-saving ideas out of the equation, we're still left with a pretty fantastic reason to buy locally produced foods... flavor (and isn't that what it's all about anyway?). My experience with flavor though, came because of these hardships. My beautiful row of carrots had stopped growing. I was left with one measly plant. "He" held strong, but I saw the signs that he too was soon to wilt away from the onslaught of neighboring plants. Reluctantly, I pulled this sad little carrot from the ground trying to salvage at least one from my diminutive crop. It didn't measure more than 12 cm. I took this tiny trophy to my wife (for whom the carrots were for to begin with) and proudly presented to her the bounty which I provided with my own two hands. After the giggles subsided, we washed off the dirt and did the only thing we could with such a humble plant... ate it raw. To say I was amazed at the difference between the carrots I'd spent a lifetime despising and this poor paltry specimen is an understatement. I'd eaten garden carrots before and always preferred them to the store-bought but never before had the difference been so affecting. There was a sweetness and fullness of flavor. There was an unmatched crispness. I knew then that I needed as much fresh produce as possible from gardens and farmers markets. While it is almost impossible for a restaurant to be 100% local (I need my coffee... it doesn't grow around here), restaurants are capable of finding items to feature that are locally sourced. We can dance around the effect it has on local economies and environmental impact, and while these are positive aspects, the real star is flavor. Freshly grown produce, locally made cheeses, locally raised livestock, and more all have an inherent beauty to their flavor. They didn't spend weeks stored in a silo or travel hundreds of miles in the back of a truck. They came from the world you live in every day, breathing the same air as you, experiencing the same rain, and basking in the same sunshine. The life of your community waltzes across the palate with every bite. We got into this business because of flavor, let's try and keep it as true as possible. 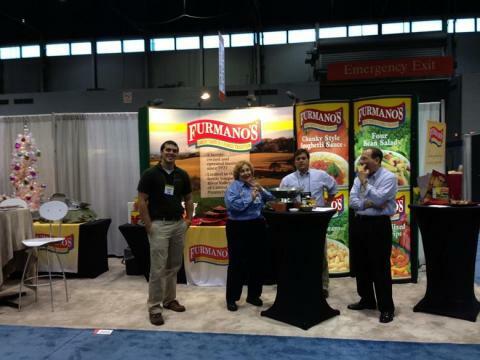 I’m finally back from Chicago where Furmano’s participated in the NRA (National Restaurant Association)… not the gun show. I’m pretty sure I have to explain that to everyone when I say that’s where I’m going. We always have fun and Chicago is a great city for this show. The McCormick Place Convention Center is centrally located with a lot of great places to eat nearby and plenty of things to see. I always come away a little happier (and a little fatter). If you’ve never been, I highly recommend making the trip sometime. The show takes place at McCormick Place every year, at the same time each year, making it easy to carve out the time ahead of time if you’d like to attend. And, it’s probably the best time of year to go to Chicago (great weather to explore the city). The show itself really highlights food and the food industry. As an operator, you get a good look at what new products are going to be available to you (and your competitors). You can find a source for just about any product you can imagine. Along with new foods and equipment available, it’s a great chance to meet and talk to others in the industry. I’m always surprised by the amount of conversations I have with people running into the same obstacles that either I have or have talked to someone who has. For me personally, I love being able to put names to faces of people I’ve been in communication with via phone or email. It’s so common these days to work with someone for years and never get to see their face. All in all, it really is a great show for people involved in the restaurant biz. The main photo above is the look of our new both set up...as promised. We received lots of great comments on our set up. If we were in the business of selling display equipment, we would have made out like bandits at this show. Much thanks to our friends at Cal-Mil. 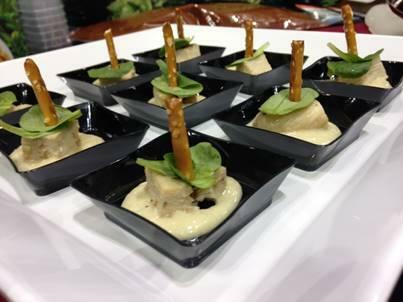 People really enjoyed the White Bean Mousse Canapé’s and Chicken Caesar Salad Skewers (made with White Beans instead of eggs). We received great responses on the samples! 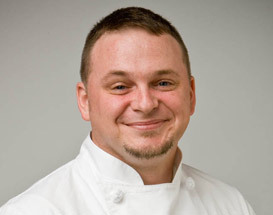 It may be a great question to ask the friend you haven’t seen in 8 years (you’ve gotten fat), but in a professional kitchen it’s a valid question for how you’re serving your customer base. In the continual quest for the next great super food (where you at acai? ), it’s easy to forget most of us have one of the world’s best already sitting on our shelves! One of the challenges I faced in becoming the chef at Furmano’s was figuring out what to do with beans. I’d used them in soups. I’d tossed them in a vinaigrette. I’d tossed them with pasta. The reality was that if I didn’t figure out something fun to do with them, I’d be out of a job. Although there are so many health benefits provided by beans, it’s still tough to get them into the bellies of people who don’t like them. I understand completely. As a child, I was awful to feed (sorry Mom and Dad). One of my father’s favorite stories… When, at a family reunion, I made a complete production in front of everyone, absolutely refusing to eat the baked beans they put on my plate. Of course my dad got a big kick out of me getting this job (do parents have to be right about everything... I’m still glad I didn’t listen). What I’ve found, is that beans are more versatile than I ever imagined (don’t tell the people I work for that I had no idea what I was doing when they hired me). Yes, beans are excellent in their traditional uses, but then we’re limited to the customers that choose to eat them. With such a low price point per serving (about $.03 per ounce, depending on the bean), anywhere we can work them into a meal is money in your pockets! We also see more and more government regulations that require nutritional information to be available for your menu. 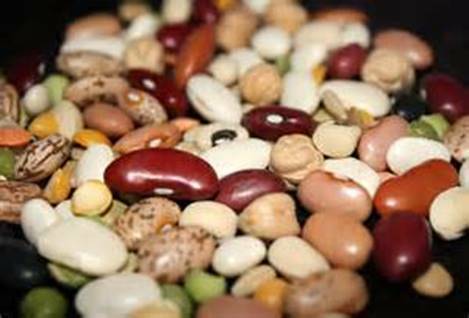 You’ll will certainly see an uptick on the nutritional panel as you infuse protein, fiber, and iron into your items with beans. Our website has lots of great recipes using beans in “non-traditional” ways. I find pureed beans to be especially versatile. They make great emulsifiers and add an incredible creaminess to the mouth feel of the products you make. I’ve used them as simply an additive to a traditional recipe, or to replace functional ingredients like eggs or other thickeners. So take a chance, try using your beans a little differently and see what happens! 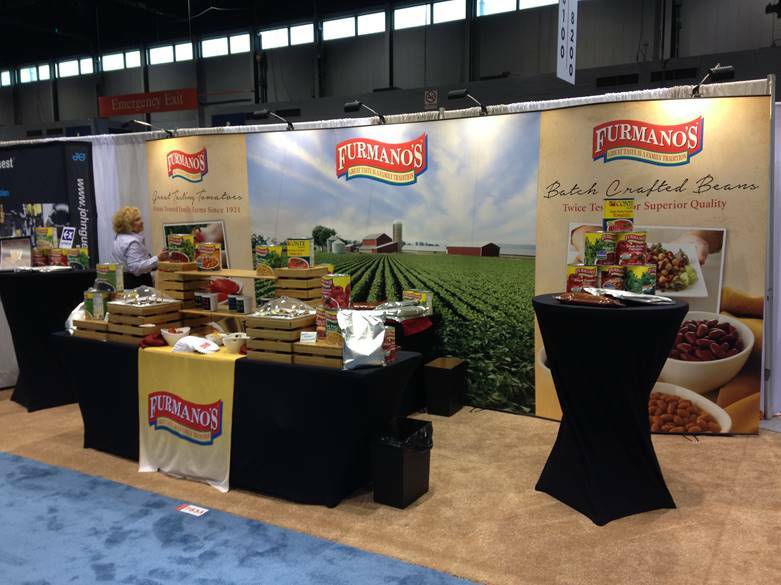 For the past several years, Furmano’s has taken part in the National Restaurant Association show in Chicago.It’s a fantastic show with lots of great eats. Companies from all over the world come out to hock their wares in search of new customers. And that’s my lovely sales team modeling the old booth. They’re such a great group of people to work with and they really go out of their way to help our customers. The new booth has a great look. It combines contemporary design with a real focus on our agricultural roots as a company. I’ll post pictures of the new set up post-show, but if you’re going to be attending the show, please stop by and say “Hi”! We’d love to see you… BOOTH #7833. What will you be tasting this year? How does Hummus Yogurt Chicken Salad sound? I replaced the mayonnaise with a blend of chick peas and Greek yogurt! Maybe Chicken Caesar Salad Skewer? Caesar dressing without the egg but rather White Kidney Beans, talk about cutting back on cholesterol! 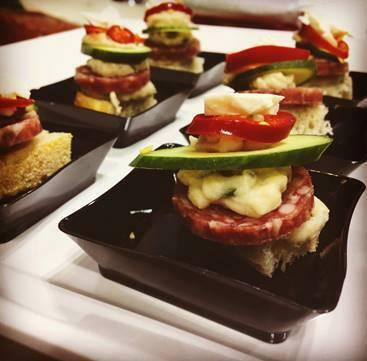 We’ll also be making same Italian Meat canapés with a savory rosemary white bean mousse. I’ll have the recipes available there if you’d like to make them yourselves. As we begin the transition to Spring flavors, our recipes need to be reflective of both cool evenings that crave comfort and warm sunny days longing for freshness and excitement. It's the perfect time to pull out recipes in order to explore both mindsets. Give them comfort and crispness! Give them bright flavors and healthful hardiness! Give them the confidence to take their shirt off at the pool but the wisdom to know it's not quite time for that yet! (When I think of my early spring shape…. "round" seems to come to mind). Make your guests transition seamless this Spring by taking them into their next season of eating. 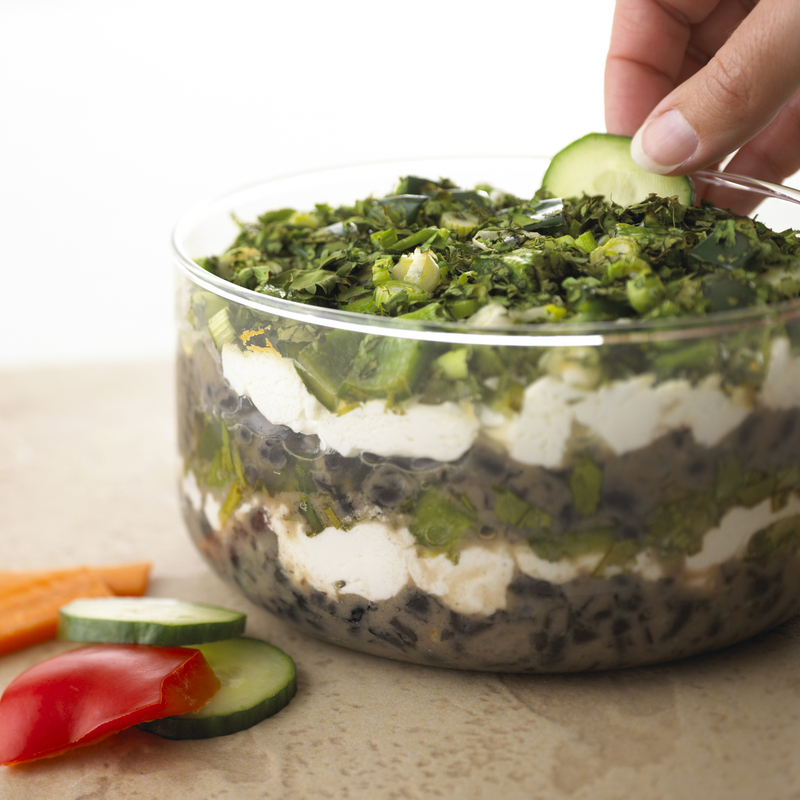 Enjoy the attached Black Bean Goat Cheese Dip recipe. Fullness of rich cumin, garlic, and black beans are set against bright flavors of cilantro, green onion and the gentle heat of poblano chilies and creamy goat cheese. In a medium sauté pan over medium heat, add Olive Oil. Add Garlic and Cumin. Sauté for 3 minutes. Add half of the Furmano's Black Beans. Heat and then mash. Add remaining half of the Black Beans, Chicken Broth, Salt and Black Pepper. Set aside. In a large bowl, mix together Poblanos, Green Onion, and Chopped Cilantro. In an ovenable dish place half of the bean mixture. Top that with half of the goat cheese. Top that with half of the Poblano mixture. Repeat. Bake in oven for 30-35 minutes. Serve hot. Leave the past behind, it can't be changed. Don't worry about the future, it hasn't happened yet. Seems like great words to live by right? Yet we still seem to spend a majority of our waking hours worrying about them both. Don't fret though…there are valuable lessons to be garnered from what can't be changed and how it affects what hasn't happened. In food, we are constantly looking for the next great innovation, while worrying about our depleting food stocks and farm lands. A quick look into the past creates an eye-opening revelation of a food perfectly designed for our ever growing population and health concerns. Domesticated and valued by Native Americans in South and Central America, beans served as a staple of the diet of the many tribes and cultures. Long before we knew or had the science to prove it, they understood that beans offered high concentrations of protein, complex carbohydrates, and fiber necessary for survival. In short, all the good things we now strive to put in our diets today. In today's foodservice world, we are constantly challenged to offer our customers a more healthful, cost effective source for our nutrition without sacrificing the flavor we've become accustomed. Beans offer an incredible vessel for flavor infusion to pair with nutrition. The subtle flavors of the different bean varieties are complimented by the crisp freshness of herbs and citrus flavors while standing up to heavy spice and heat additions. They even lend themselves to sweet applications (and we're not just talking baked beans here folks). Imagine fortifying dessert options with additional protein and fiber. The bean can be the blank canvas you take a broad brush to. So go ahead and look into the past. Examine some tried and true traditions and ideas with an eye towards how to do it different. We're so quick to be innovative, but we forget that some of the old ways were done that way for a reason. 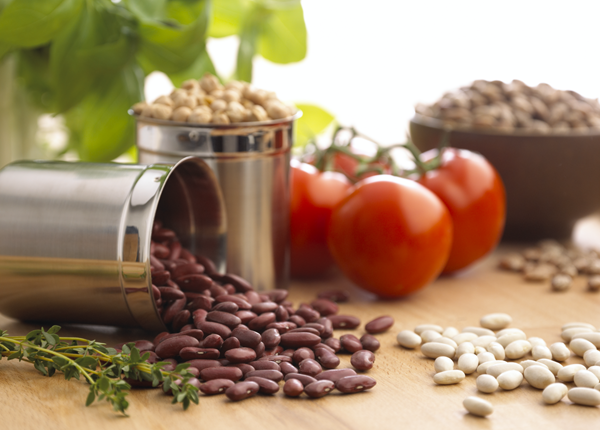 Retrofit beans back into your diet and your menus. Take that old staple and turn it into your surge to the future.